Great Taste: It’s all about clean water. And a healthy life begins with clean, healthy water. It doesn’t get any more basic than that. Made in the U.S.A. by a family-owned company. Made in the USA and designed to fit on most countertops, the ION™ makes a great office water cooler where space may be limited. It connects directly to your tap water supply and uses a 0.5-micron, commercial-grade carbon filtration system to remove far more than just chlorine, taste, and odor. Just press a button to enjoy an endless supply of cold, hot, or sparkling water. High Performance unit for commercial business and High Volume use. Ice Bank Technology provides 8 gallons of cold drinking water per hour. Sealed System protects drinking water from airborne contaminants. No Storage Tank – Water is Fresh, Filtered, Chilled, and in your cup. EZ Change Filter is monitored for Quality and Confidence. InstaChill™ Every glass is freshly filtered and instantly chilled in a Sealed Water Pathway, where air never contacts the water supply. Unlike other coolers, ION’s proprietary design has no reservoir to clean or sanitize. Cooling Capacity Dispense a 7 ounce glass of water every 30 seconds, for an hour… and ION makes sure it’s 42°F or colder. No other cooler even comes close. RapidHot™ Tea, cocoa, and even instant soups are delicious with piping hot, freshly filtered water. Up to 2 gallons per hour, convenient and ready whenever you are. Sparkling Water Option Indulge your healthy lifestyle with the healthy alternative to soft drinks. Perfect with juice, a twist of lemon or lime, or try SPLASH™ flavorings from Natural Choice. Save Energy Why run an appliance when the building is empty? ION’s SleepMode™ reduces energy consumption on evenings and weekends. Compact Size ION fits anywhere, from your kitchen counter to a university cafeteria. 9″ Dispensing Height Easily fill cups, carafes, coffee pitchers, and water bottles. Hygienic Design From the Sealed Water Pathway, ION dispenses your freshly filtered water from an easily replaceable faucet. Childlock Requires hidden button to dispense hot water (user settable). ION Microprocessor Control Proprietary software and precision sensors deliver exact temperature control and ensure high performance under extreme conditions. ION Complies with ADA Requirements To comply with the regulations of the American with Disabilities Act (ADA), Natural Choice Corporation evaluated all applicable guidelines and incorporated the requirements into the design of the ION Drinking Water Appliance. 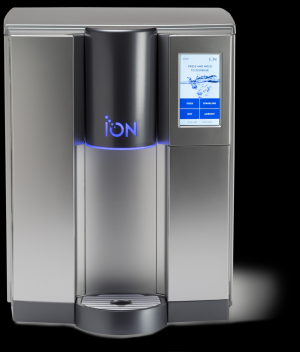 In all cases, the ION Drinking Water Appliance complies with the ADA regulations. 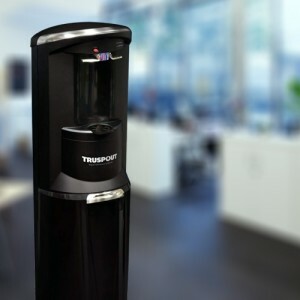 Convert the powerful ION Bottleless Water Cooler into a floor-standing appliance and place it anywhere you need pure refreshment.